The Battleship New Jersey and Camden County Freeholder Board will offer active military personnel from Joint Base — McGuire-Dix-Lakehurst and Dover Air Force Base a full-course turkey dinner on Thanksgiving. The meal will be prepared by Andreotti’s Catering and served by volunteers from the Battleship at approximately 11:30 a.m. The troops will arrive at approximately 10:30 a.m. A brief welcoming ceremony will take place on the fantail before dinner is served. Residents are invited to welcome and cheer on heroes from the pier of the Battleship, which will be open for guests at 10 a.m. Free parking is available in lot №1, across from the Susquehanna Bank Center. Entertainment and refreshments will be available for guests on the pier. Berthed on the Camden Waterfront across the Delaware River from Center City Philadelphia, the Battleship New Jersey Museum and Memorial is a non-profit historic ship museum that offers tours Saturdays and Sundays, as well as a few special weekdays, through December. Consult the Battleship’s website for a schedule. The Battleship also offers overnight encampments for youth groups and families, special group and student tours and event rentals with a full catering menu. 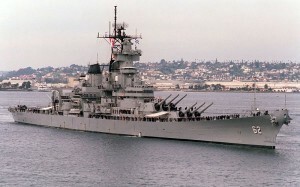 For more information on the ship’s many programs, visit www.battleshipnewjersey.org.